Brown’s commitment to diversity is highlighted in Brown’s strategic plan, Building on Distinction. 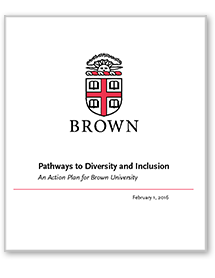 The detailed vision for realizing this commitment is articulated in Pathways to Diversity and Inclusion: An Action Plan for Brown University, which outlines a set of concrete, achievable actions to make Brown a more fully diverse and inclusive community. After an engagement process involving broad campus-wide discussion and input, President Christina Paxson shared the plan with the Brown community on February 1, 2016. The plan acknowledges that institutions of higher education, including Brown, have traditionally failed to fully include people of all races, ethnicities, creeds, socioeconomic classes, gender identities, sexual orientations, and disability statuses. To confront this reality and its enduring legacies, Brown is committing to transforming the policies, structures, and practices that have led to the exclusion—rather than the meaningful inclusion—of members of our community. The implementation section of this website shares summary tables of the actions outlined in the Pathways to Diversity and Inclusion Action Plan (DIAP). This serves as the "living plan,” tracking the progress of our efforts. Timeline of Diversity and Inclusion Efforts: This is a history of Brown community activism and University efforts in the journey to become a more diverse and inclusive campus. In addition, included in the plan are appendices that share available data on historically underrepresented groups at Brown, and the process for oversight of progress toward diversity and inclusion that allows for ongoing community input. The final section of the plan sets forth opportunities for sustained engagement with the Providence community around issues of diversity and inclusion. The Pathways to Diversity and Inclusion Action Plan is expected to evolve as it is implemented and as circumstance require. The plan outlines a vision for how Brown can develop best practices and serve as a leader in promoting more just, diverse, and inclusive communities. This is central to Brown’s mission.